The SOFA CHICAGO VIP Program is open to VIP ticket and pass holders. All events are open on a first-come basis. Off-site event transportation is not provided unless noted. Early previews of the fair as a VIP heightens the overall experience of the individual by offering better, intimate engagement with the gallery owners, artist and artworks presented. VIPs also have access to additional areas of the fair, including a private bar and lounge area. Upgrade to a SOFA CHICAGO VIP Pass here. As the Official Automotive Sponsor of SOFA CHICAGO, Cadillac is pleased to offer exclusive transportation for select SOFA CHICAGO VIPs during all admission hours Thursday, November 1 through Saturday, November 3. This exclusive service will provide transportation for residents who live within a 10-mile radius from Navy Pier. Drop-offs and pick-ups will be located at Navy Pier Entrance 2. Eataly will offer a curated selection of Italian favorites, such as housemade mozzarella, cured meats, artisanal cheeses, antipasti, pastries, and more. SAMA is a non-profit organization dedicated to educating, inspiring, and promoting excellence in mosaic arts. 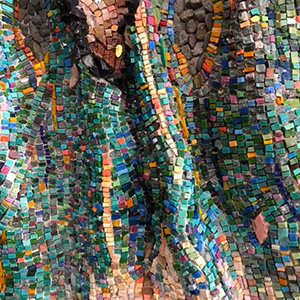 Learn the art of mosaic through helping to create a piece with the artist Julie Dilling. An intimate conversation with glass artist Deanna Clayton who has been working with glass for over 20 years. 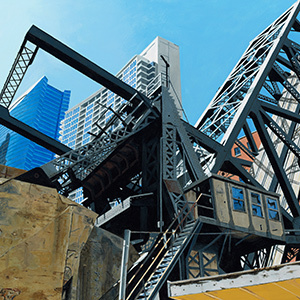 Chicago artist Roland Kulla talks about his painting process and technique in his photorealist bridge paintings. The subjects artist John Peralta choose for the Mechanations series are icons of utility and invention. John also likes to think they hold memories that we've long forgotten. They've watched generations pass; recorded every scene, love letter, and document. Each image, word, and note is permanently imprinted on them. Andrew Myers creates progressive mixed media works with screws, oil paint, charcoal, bronze, cement, and found objects. To truly experience Andrew’s art, it must be seen and even touched. Debra Steidel’s career dates back to the American Craft Councils shows of the 1990’s where she debuted her marine-inspired textural, ceramic sculptures and was widely represented by numerous international galleries. The composition of her ceramic carvings and ornamental lids are reminiscent of the works by French visionaries Émile Gallé and René Lalique. Kate Blacklock is a Providence based artist who received her undergraduate degree from University of California at Santa Cruz and her MFA from The Rhode Island School of Design (RISD). Blacklock’s studio work has moved from sculptural and functional ceramics to 3D printing, photography and painting. She has had solo exhibitions around the country including, New Orleans, New York City, Philadelphia, Providence and Ann Arbor. Join Modern Luxury for a cocktail reception in the Living with Art Lounge before the panel discussion. Kevin Wallace is an arts advocate, educator, author and curator. His most recent book Intersection: Art & Life shares the value of the arts in modern society by placing contemporary art within the context of the history of humanity. Director of the Beatrice Wood Center for the Arts in Ojai, California, Wallace is a regular contributor to international publications and guest-curates exhibitions for museums. The perfect marriage of medium and artist occurred when Gary Traczy of Miami, Florida found his muse in steel. He manipulates metal into breathtaking arabesques of seemingly lightweight form. Panel discussion with Chicago based designers and artists Douglas Van Tress, Marco Miller, Nicholas Moriarty and Vincere lead by Modern Luxury's Editor-In-Chief Andrea Mills. Join The Golden Triangle and The River North Design District Friday Night at 7pm for an exclusive VIP kick-off after party in a grand mansion full of modern art & antiques. The event features stunning artwork by Adam Siegel from his new show Archetype: Excavation + Expectation. The secret night of culture includes dance and performance art, chic music, innovative food and artisanal libations. Event orchestrator Jon Cotay, Chicago's elite party maven, will collect the best of Chicago and the world under one roof, for an event you won't want to miss. Event will be held at the Golden Triangle on 330 N Clark Street, and tickets cost $35 each to benefit the River North Design District.